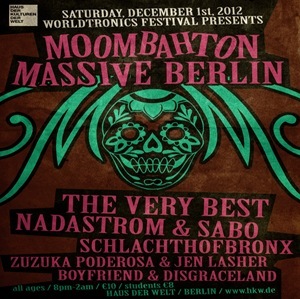 Tonight the famous Moombahton Massive will be in Berlin for the first time, with a massive line-up from Nadastrom to Sabo to good peeps like Zuzuka Poderosa and Schlachthofbronx. If you are in the city, this is definitely something not to miss! Moombahton godfather Dave Nada is giving us some exclusive insights before it all goes down tonight. Stay tuned for more interviews and don’t miss the fun tonight! Hey Dave, we are very excited to have Moombahton Massive here in Berlin. The night is going to be part of the Worldtronics festival, which every year brings musicians from all over the world to Haus der Kulturen. What is your impression so far? Very excited about Worldtronics! 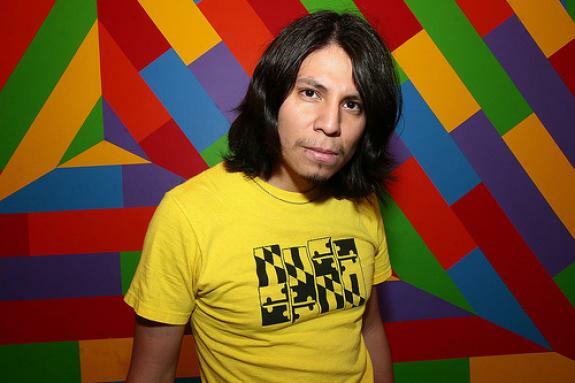 This isn’t only the first time for Nadastrom in Berlin, but the first ever official Moombahton Massive event. So how did this event come about? How does the Moombahton Massive end up at Worldtronics? The good people at Worldtronics reached out to me about doing a Moombahton night at their Worldtronics festival. I thought it would be great to do a proper Moombahton Massive like how we do in the States: Nadastrom & Sabo plus special guests involving artists from around the world related to the Moombahton sound. You’ve got such a strong lineup of the usual suspects, yourself, Sabo, but you’ve broadened it to include The Very Best, Schlachthofbronx, Boyfriend, Zuzuka Poderosa and Disgraceland. How do they fit in? Everyone on the lineup has a love for Moombahton and play it at their sets! They are also good friends and rep Moombahton worldwide. Boyfriend and Disgraceland bring the deeper, techier approach to Moombahton. Jen Lasher & Zuzuka Poderosa bring their fire vocal work to Tropical Bass. Schlachthofbronx murders the bass game on all angles from Moombahton to Bounce to Cumbia to Kuduro. And then you have The Very Best to round out the night with their amazing take on African Pop meets Bass Music. It’s all relative! Despite being global, the European presence has been been limited thus far. As well as being a huge party is this a chance to win over new fans? And how do you hope the sound will go down? I think it’s a great opportunity to show Berlin and other world region representatives how Moombahton music really throws down! Is this kind of event the best way to showcase the sound? Is it a big sound that works well at festivals? We’ve been here all week to experience the festival in its entirety and, I have to say, this has got to be one of the most appropriate events to showcase Moombahton music. The sound is very diverse and flexible with the ability to rock basements to stadiums. I’ve experienced both and seen it pop off! How does it feel to be in Berlin? It’s a place that has contributed loads to music history, from Bowie in the seventies to the Berghain – does that affect how you approach the gig? It feels great to be in Berlin. There’s a strong sense of musical knowledge and taste here. And most importantly, people here seem very eager to party and have a good time. It’s everything I’ve imagined and more. Soaking up the city this past week definitely gives me some perspective on how I wanna approach our set for tonight for sure. Has that legacy had any influence on you as artists? Moombahton has and continues to be an inspiration for me as an artist and a person. It’s quite personal and I’m always thinking of new ways to approach the music! Are you planning to check out the rest of Worldtronics? Maybe soak up some Berlin vibes? I’ve been here all week and been blown away from all the nights and performances. Loved the Tecno Brega night repping Brasil, Sinotronics reppin awesome Post Noise Techno from Beijing, and the irresistible deep sounds of House Nation South Africa. I’m like a sponge over here [laughs]!